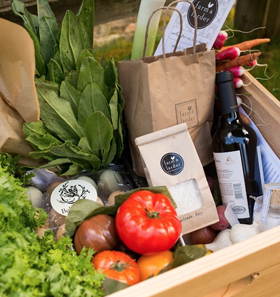 For $135 per week, you can have our fresh Farm & Larder goods hand-delivered to your home. Each subscription will be paid for in advance and your total will be reflected at checkout. 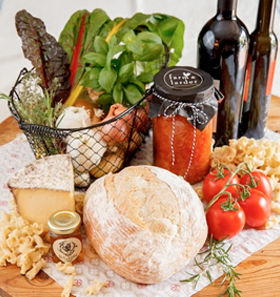 Tax and local delivery within our delivery area is included with your subscription. How does it work? A stylish, handcrafted wooden box will be delivered to your doorstep, where it will remain throughout the duration of your subscription. This is where your weekly Farm & Larder goods will be placed each week. These wood boxes are actually designed and made for housing honey bees and they are the same boxes we use for our honeybee hives in our apiary at the Farm. They are stacked on top of one another and filled with frames where the bees live and make honey. 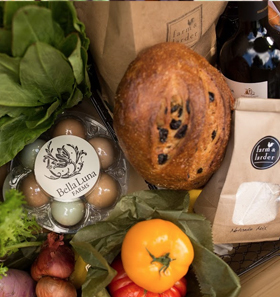 Every week on your delivery day, between 11:00 am and 5:00 pm, we will fill your box with fresh, organic goods including bread, wine and a dozen eggs as well as fresh vegetables, fruits and housemade provisions for you to enjoy. You will also receive recipe cards with suggestions on how to use your weekly Farm & Larder goods.